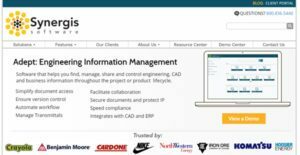 Synergis Adept is an engineering information management platform that helps businesses search, manage, share and control CAD, engineering and other important business information through the product and project lifecycle. It simplifies document access, helps automate workflows, manage transmittals, facilitates collaboration and integrates with a variety of ERP and CAD systems. Trusted by some of the key industry players across different sectors, Adept aims to free businesses from usual operational chaos and provides an easy-to-use platform that helps simplify compliance with the industry, connects people to documents and streamlines collaboration. It allows managing millions of documents for large projects across global sites, while also allowing smaller companies to streamline their processes and operations. The engineering information solutions help enterprises deliver results faster by automating manual workflow processes, simplifying compliance and protecting intellectual property. Synergis Adept comes with all the essential features needed to efficiently manage enterprise information from advanced integrations to simple check ins/outs. It helps enterprises mitigate risks, streamline change processes and improve business results. Being an easy-to-use platform, Adept is fast to implement and allows users to get started quickly. It works well for companies of various sizes and allows them to manage critical engineering documents across global sites as well as departments. It takes hassle out of the operations and information sharing by providing a centralized repository of organized data. The platform ensures that e-documents, paper documents, CAD drawing documents and related email correspondence are accessible, secure and accurate so the authorized users can access them at the right time. It supports a variety of CAD and business apps, including Autodesk CAD and Inventor, Microsoft Word, SolidWorks, MicroStation, Architectural Desktop, Civil 3D and more. The collaboration tools allow users to share critical documents and communicate easily anytime across different time zones. To make collaboration more effective, the data is served in the native language of the target country, which makes collaboration at a global scale possible. The built-in Enterprise Visualization allows enterprises to view, print and collaborate on any document format using a single platform. Stakeholders can easily access such documents and provide their feedback at each stage during the entire product/project lifecycle and design process. If you are interested in Synergis Adept it may also be beneficial to check out other subcategories of Best CAD Software gathered in our base of B2B software reviews. Companies have unique wants and requirements and no software solution can be ideal in such a situation. It is useless to try to find a perfect out-of-the-box software app that meets all your business wants. The wise thing to do would be to modify the application for your unique requirements, staff member skill levels, finances, and other factors. For these reasons, do not hurry and subscribe to well-publicized leading systems. Though these may be widely used, they may not be the ideal fit for your unique wants. Do your homework, look into each short-listed application in detail, read a few Synergis Adept reviews, contact the vendor for clarifications, and finally settle for the product that provides what you want. How Much Does Synergis Adept Cost? Contact the vendor for their enterprise pricing information and other product details. We realize that when you make a decision to buy CAD Software it’s important not only to see how experts evaluate it in their reviews, but also to find out if the real people and companies that buy it are actually satisfied with the product. That’s why we’ve created our behavior-based Customer Satisfaction Algorithm™ that gathers customer reviews, comments and Synergis Adept reviews across a wide range of social media sites. The data is then presented in an easy to digest form showing how many people had positive and negative experience with Synergis Adept. With that information at hand you should be equipped to make an informed buying decision that you won’t regret. What are Synergis Adept pricing details? What integrations are available for Synergis Adept?